Have you noticed the shiny new badges in my sidebar? So proud. As I told Delphine last night, I'm a bit like a swan. All calm and elegant up top. Underneath, I am frantically hyperventilating! We are sponsored by A Day For Daisies. 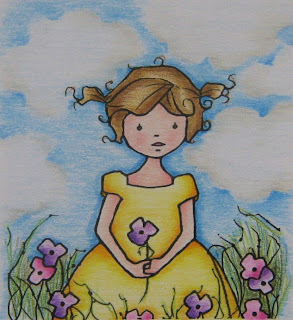 I've been noticing A Day for Daisies images popping up in BlogLand, and I'm a fan, so it was a real pleasure to play with this one. I've also been admiring cloud backgrounds, they look so cool. I've been wanting to have a go for a while, but been a bit 'worried'. 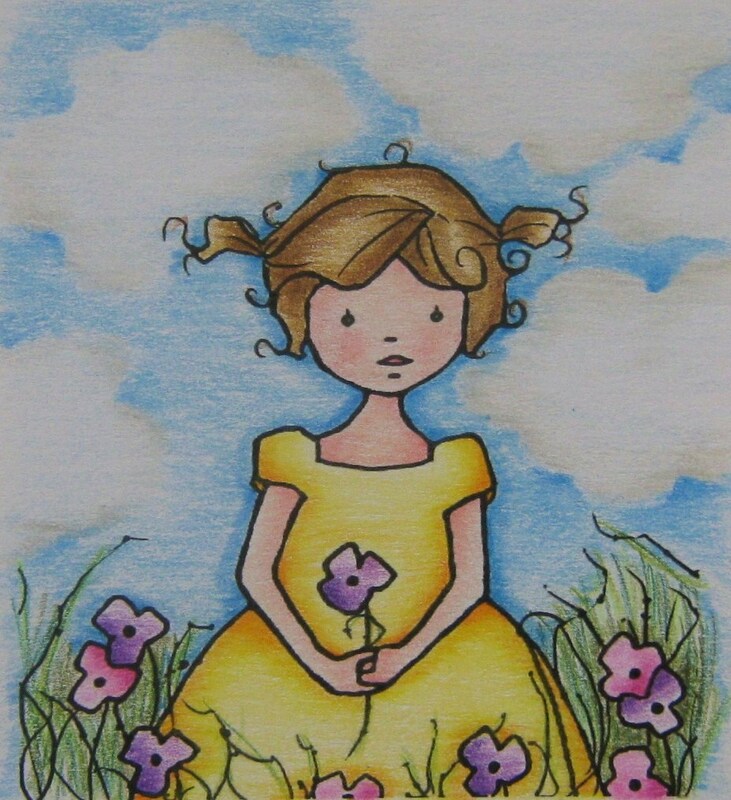 So this image sat on my desk, coloured apart from the background, while I stopped at Dorcas and Annekas' Blogs. They both do the most amazing things with pencils! I got even more terrified after paying them a visit, so the image sat there a little longer. I eventually got the guts and kind of did my own thing. No way near as good as Dorcas and Anneka would do, but you get the gist! So, don't forget to pop over to MMCS for all the details and to see the pretty cards from the rest of the DT. Best be quick, I've been yabbering here for so long, the Challenge is probably over by now! 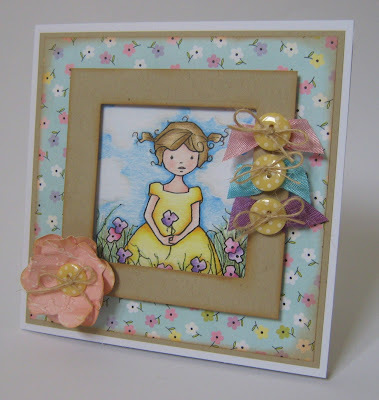 Sweet Stampin - Something Old, Something New! Gorgeous card Faye, I like the image and design. gorgeous card, Fluffy...congrats on your new badge(s)...you so deserve them! ooooooohhhh, now this is just gorgeous!!! How well does that paper match the flowers on the image?!?! Such a sweet and pretty card! LOVE your clouds too. Fantastic! And congrats on ALL your wins!!! Positively precious!!! LOVE the paper and the fabby way you did the buttons to match! Your sky is incredible - don't even think twice about it!!! I have this image ready for Saturday on SS, Isn't she just adorable. I went to the website and bought three images in all. So pretty faye! Looks a picture in a frame! Your clouds are great! So fluffy! That paper is perfect and love the flower and buttons too! Faberoony hon, it's soooooo pretty!! Loving the frame idea too!! Oh my word Faye what a beautiful creation that super image that you have coloured and framed beautifully also love the paper, flower and the buttons a truly wonderful card thank you for joining us at Digital Tuesday this week. So thats what the panic about how to do Fluffy clouds was all in aid of!!!!! Very nice they are too. Luv Muver. Well I think you did a splendid job! Your clouds are pretty, love the little bit more bright blue and I think that frame is a wonderful idea. Go and have some chocolate to celebrate a job well done! This is fantastic, Faye! I love how you've coloured the sky! Thank You for playing along at Sweet stampin this week! wow Faye...your little fluffy clouds are amazing!! Lovely elegant card. Thanks for joining us this week at Sweet Stampin. A gorgeous card Faye, and the paper is so pretty! Hey sweetie, so sorry I've not been to comment, but I have been looking quickly while passing through and they are all fab, I think your clouds are sooooperb! and what a lovely image too. I LOVE your cards, but then you already knew that. Hi Faye! Now don't go feeling insecure about your coloring. YOur card is drop dead gorgeous! I love ADFD too and this images is just the sweetest! That card is breath taking! A fabby card Fluff. I love your cloud background, I'm still trying to get it together to have a go at this with my copics! Hi Faye - love the way you have framed this. Really original. Thanks so much for your lovely comments, it is lovely to catch up with you. Hope all is well in FayeWorld with you and your family. Oh my goodness!!! This is absolutly adorable!! This has to be my all time favorite card you have made!!! !